PanARMENIAN.Net - On October 10 Yerevan hosted the first Economic Forum held within the frames of the XVII Summit of La Francophonie. The event, which brought together representatives of more than 50 countries, launched with opening remarks from Armenian President Armen Sarkissian and Secretary-General of the International Organization of La Francophonie Michaëlle Jean. Thematic sessions, featuring keynote speakers followed afterwards. Christoph Speck, the General Manager of Coca-Cola Hellenic Armenia, was among the speakers of a discussion titled “Perspectives and Challenges of International Trade Relations”. Speck, in particular, unveiled the company’s more than 20-year experience of business activity in Armenia, the positive aspects of doing business in the country and the challenges it faces. “Our key message is that, of course, there are challenges in Armenia but this is a wonderful country for investments. We would like to see more international companies entering the Armenian market and are always ready to share our experience,” Speck said. When detailing the challenges, the General Manager of Coca-Cola Hellenic Armenia cited the limitations of the small market, the geopolitical situation, a significant level of unemployment and the brain drain. Among the positive aspects, according to Speck, are the positive trends in economic indicators, the GDP growth, currency stability and the quality of education. “People and the warm atmosphere are among Armenia’s most important assets. Also, education is at a very high level here. As Mr. President said in the morning, Armenia unites East and West. The combination of the positive aspects of them both offers great opportunities for development,” Speck added. 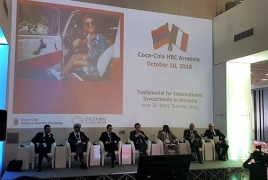 In addition to supporting the arrangements of the Yerevan Economic Forum 2018, Coca-Cola, featuring the slogan “Uniting the world for a better future”, assisted as well the organization of the XVII Summit of La Francophonie. The Coca-Cola Company operates in more than 200 countries around the globe, including francophone states. Apart from its business activity, the company pays special attention to the development of these communities. In this regard, the General Manager of the company said that despite its Hellenic roots, the Coca-Cola HBC is headquartered in Switzerland, a Francophone country itself. Besides, he said, the company constantly strives to support initiatives aimed at Armenia's socio-economic development. Coca-Cola Hellenic Armenia operates in the country for more than 20 years. Apart from its business activity, the company pays special attention to corporate social responsibility projects. Along with water stewardship, community wellbeing and youth empowerment, initiatives aimed at socio-economic development of the country are in the center of the company’s attention.